Why Pencil "Lead" is Called "Lead"
Karen asks: Why is pencil lead called lead when it doesn’t contain any? In the 16th century, a large deposit of pure, solid graphite was discovered in Borrowdale, England. This was the first time in recorded history that high quality, solid graphite had been found. When metallurgists first encountered this substance, they thought it was some sort of black lead, rather than a form of carbon. Thus, they called it “plumbago”, which is derived from “plumbum”, which is Latin for “lead”. It didn’t take people long to realize that solid sticks of high quality graphite were good for marking things. At that point, this newly discovered substance from the mines of Borrowdale became extremely valuable. So much so that guards were eventually posted at the entrance to the mine and laws were passed to stop people from stealing the solid graphite. In addition, once a sufficient stock of the graphite was mined, the mine itself would be flooded until more graphite was needed. Of course, sticks of pure graphite are fairly brittle, so people started embedding them in various things such as hollowed out pieces of wood and also simply wrapped tightly in sheep skin. Thus, the pencil was officially born with a core of solid graphite, which was known then as black lead. The tradition of calling sticks of graphite “lead” has endured to this day. English speakers aren’t the only ones who still follow this misnomer. The German word for “pencil” is actually “bleistifit”, which literally means “lead stick”. There was a form of writing instrument before the pencil called a stylus that sometimes was made of lead. The stylus was a thin rod used originally by the Ancient Romans, and later by many others, for writing without ink. The stylus was made with a very sharp point and could be used to write on wax tablets. 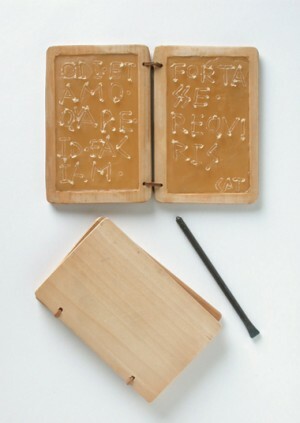 This was also a reusable form of writing in two ways. First, each stylus generally had a blunt end for rubbing out some bit of writing on the wax. Second, the entire wax tabled could be “erased” by simply warming up the wax sufficiently until the writing disappeared. These stylus, which were occasionally made of lead due to its cheapness and how easy it is to work with, are sometimes said to be why we call pencil cores lead. In fact, though, it is as stated above- simply that people mistook graphite for a form of lead. “Pencil” comes from the Latin “pencillus”, meaning “little tail”. Graphite deposits have been found elsewhere, but nothing close to the purity and quality of the English find. Due to the impurities in these other deposits, the graphite from these must be crushed into a powder to filter out the unwanted bits. Eventually, a method was found to use this powder in pencil form, by using clay as a binding agent. But before then, England had a monopoly on the world’s pencil supplies because only their graphite deposit could be cut and made into high quality pencil form, without any other processing needed. 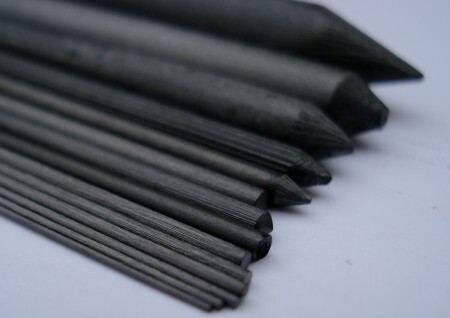 The method for being able to use graphite powder for use in pencils was independently discovered by both Frenchman Nicholas Jacques Conté, in 1795, and Austrian Joseph Hardtmuth, around 1790. During the Napoleonic Wars, France wasn’t able to import pencils from Great Britain, which had the only supply of pure solid graphite in the world. Nicholas Jacques Conté, who was an officer in the army, discovered that if you mix the graphite powder with clay, you can then form this mixture into sticks and fire this substance in a kiln. You also can vary the clay/graphite ratio to achieve different levels of hardness and darkness. This is more or less exactly how pencil cores are made to this day. Conté was also the one that came up with the system to use numbers to signify the grade of the pencil, in terms of the hardness/darkness of the core. This system was later adopted in the United States and is known as the Conté/Thoreau system (John Thoreau being the one who helped introduce it to the U.S.). This system, translated to the European system, is as follows: #1 = B; #2 = HB; #2.5 = F; #3 = H; #4 = 2H. In the European system, B stands for “Black” and “H” stands for “Hard”. The more B’s, the softer the lead and darker. The more H’s, the harder and lighter the lead. The tradition to paint pencils yellow was started in 1890 by the L. & C. Hardtmuth Company of Austria-Hungary. In 1890, they introduced the Koh-I-Noor brand of pencil, which was a top-tier pencil. The name itself was after the famed diamond. This pencil was extremely popular, due to its high quality. Thus, many other manufacturers copied the color to make their pencils look like Koh-I-Noor brand pencils. Today, yellow is the most popular outer pencil color in the United States and various other countries. However, in Germany and Brazil, green is the most popular color. In Australia and India, red with black bands at one end wins out. A certain type of lead (tetraethyl lead) was once commonly used in gasoline in order to reduce engine knocking (For more on this, see: Why Was Lead Added to Gasoline). However, this had the negative side effect of releasing massive amounts of lead into the air, which is of course toxic to humans and to the environment in general. So “Regular” gasoline has been phased out in most of the world in favor of “Unleaded”. What Makes #2 Pencils So Special? In Italian, a pencil is called ‘matita’ from haematite (ferric oxide) which was used as a writing material. I wondered if ‘mina’ might be somehow related but the connection seems rather tenuous. actually, the word “mina” is used in many different Spanish speaking countries, not only in mexico!!! In Germany, it’s similar: The “lead” is called “Mine”, which is also the same as in the German words for gold mine and the weapon (like in minesweeper). Also, the reservoir of a ballpoint pen is called “Mine”. I also don’t know, why it’s like this, I always thought it was a coincidence but maybe it’s because the lead or the reservoir lies inside the pencil/pen like a mine in rock and supplies your “writing resource”. These stylus, which were occasionally made of lead due to its cheapness and how easy it is to work with, are sometimes said to be why we call pencil cores lead. Technically, the correct plural of stylus is styli (because it’s a Latin word) not stylus, although many people say styluses nowadays. Actually, the German word for pencil is “Bleistift”, not “Bleistifit”. Typo…?